Supplies up to 1500 watts of household electricity! XPower Powerpack 1500 is a portable power system that can supply up to 1500 watts of household electricity – enough to run almost any electronic product or appliance you might connect to your wall outlet at home. XPower Powerpack 1500 consists of a battery pack that stores electrical energy, state-of-the-art electronics that convert 12 volts from the battery pack to household power, an AC power panel that contains two standard outlets, and a DC power panel that is used to run 12 volt products. 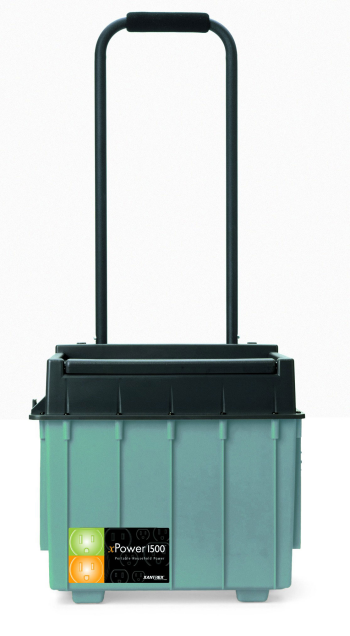 These components are packaged into a rugged “cart” with a removable waist handle that allows XPower Powerpack 1500 to be wheeled from room-to-room or outdoors over rough terrain. XPower Powerpack 1500 is an excellent alternative to a generator – no noise, no fumes, no fuel, and no moving parts. With the accessories provided, recharge XPower Powerpack 1500 using utility power from your wall outlet, from your vehicle, or from a solar panel. It is estimated to power a 150 watt AC powered product for 3 hours, not 4, a 25% difference. 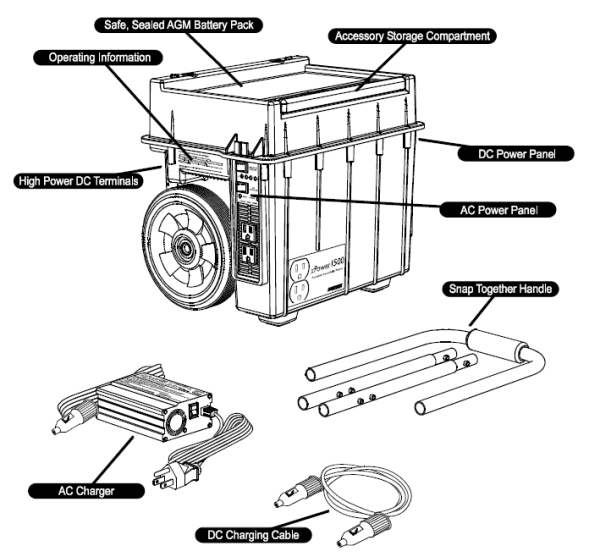 The "Xantrex X1500" is a small capacity solar generator. If you are making the purchase for DC power, this item is great. Originally this was bought for camping escapades.Although it does run AC products, it does not do so for long. if the devices are fairly high (100 W )wattage. I use the Backup 1500 for emergencies and appreciate it because it is expandable. For example, I began with the power pack and then raise the capacity by 3x with a 120ah nautical battery.